While I am no Boyden-level expert in channelrhodopsin, I have photostimulated neurons in the olfactory bulb, and now am trying to use the delightfully named PINP technique to record from specific layers of cortex. Given this rudimentary experience, I am increasingly frustrated by the sloppiness of optogenetic research in good journals. Today I would like to highlight four articles that used channelrhodopsin sub-optimally. (To be 100% clear, I am not commenting on the quality of these papers as a whole, or the researchers who conducted the experiments. I am merely saying that I think the optogenetic experiments could have been done better). The first pillar is to always perform negative controls. Light is energy, which means light can cause heat. Light can heat tissue, but Michale Fee even thinks that metal electrodes can heat up if stimulated long enough. For example, in a set of experiments I did last fall, I photostimulated neuromodulatory neurons while recording from the olfactory bulb, and saw some interesting changes in activity. When I performed the histology, I found out that the infection had not taken, and what I was witnessing was a heat-induced artifact. To control for heat during photostimulaiton, you must do two things: first, reduce your stimulation power and time as much as possible to minimize the risk of heat artifacts; and second, always, ALWAYS perform negative controls in non-channelrhodopsin animals. The second pillar is to pulse your light. Channelrhodopsin is a non-specific cation channel. This means that when the channel initially opens, the increase in conductance causes a large depolarization. However, if you keep the channel open, you have no idea what's going on. Some neurons will continue to happily fire action potentials, while others will go silent. You could even, theoretically, get shunting inhibition from the increased conductance. To avoid these problems, and have a better idea about what your stimulated neurons are doing, you should pulse your photostimulation for 1-10 ms, and stimulate at 1-50Hz (or even higher if you have a new fancy channelrhodopsin). Pulsed light stimulation also helps avoid heat artifacts. Given these pillars, I'd like to highlight four papers in high profile journals from big name labs that did not use them. Hopefully I don't stick my foot in my mouth. From the Petersen lab at EPFL, this paper followed neither pillar. They recorded intracellulary from neurons in barrel cortex while photostimulating thalamic neurons expressing ChR2. When they stimulated the thalamus, the used a 5 second ramped light pulse. Intracellular recording from barrel cortex during photostimulation of the thalamus. Photostimulation caused a change in the frequency of membrane fluctuations. From Figure 3, Poulet et. al., 2012. In the supplementary information, they tried to justify... something by showing that a stepped light pulse caused whisker deflections, while ramped light pulses did not cause whisker deflections (see below). To me, this is just another argument in favour of short, pulsed stimulation. With the step pulse, the whisker activity was at the beginning of the pulse, when you know the photostimulation is causing spikes; the lack of whisking afterwards shows you don't know what's happening during the last four seconds of the pulse. Furthermore, the ramped pulse elicits no whisking activity, showing you don't know what the heck that protocol is doing. (left) Square pulse photostimulation causes whisker deflections (individual trials, green traces), primarily at stimulus onset. (right) Ramped photostimulation causes no whisker deflections. From Supplemental Figure 6, Poulet et. al., 2012. 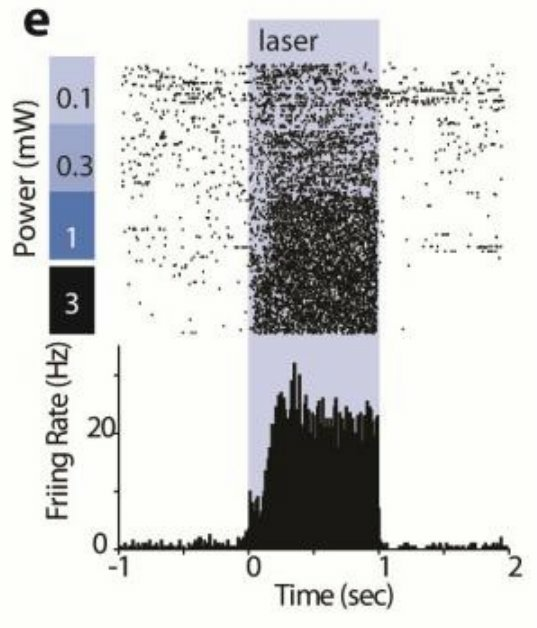 I don't know squat about barrel cortex or the thalamus, but this is a flabbergasting experiment: their light stimulation is too long, and may cause heating; they don't have any stimulus control; and they never performed photostimulation in a non-ChR2 animal. From the Luscher lab next door, this paper has a couple problems. They recorded in vivo from the VTA of GAD-cre mice infected with floxed-ChR2 (viz. GABAergic ChR2 neurons). 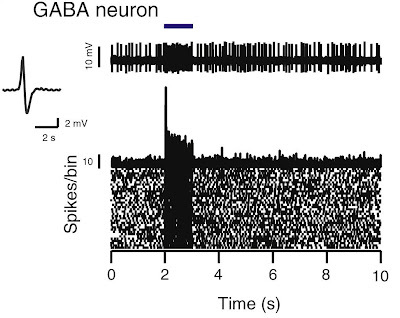 To identify whether neurons were GABAergic, they used 1 second light pulses. This is a minor sin, since the neurons are fast spiking, and they infected GABAergic neurons, making non-specific excitatory activity unlikely. However, they really should have PINPed it. Extracellular recording in vivo in GAD-ChR2 mice. 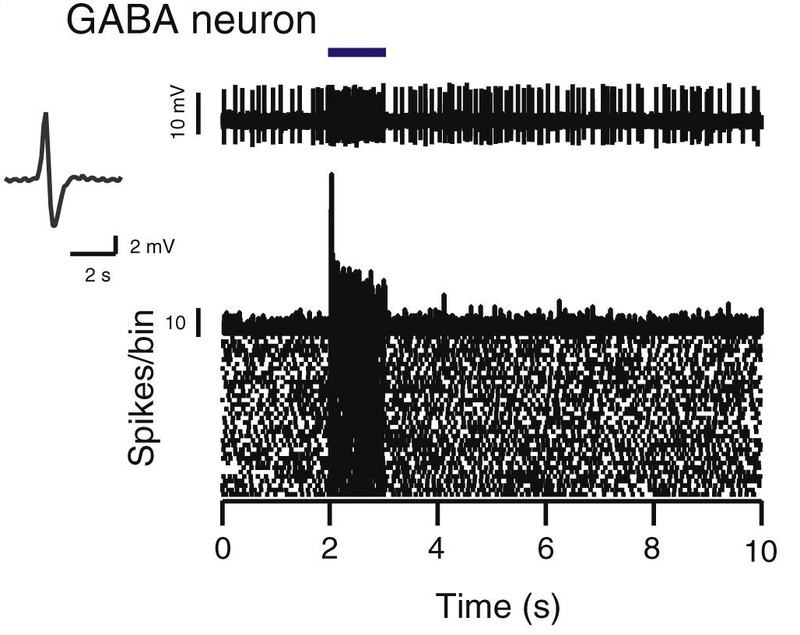 Photostimulation excites GABAergic neurons. From Figure 1, Tan et. al., 2012. More troubling, they performed a conditioning paradigm, where "the laser was continuously activated when mice entered the conditioned chamber for a maximum duration of 30 seconds to avoid any overheating of the brain structures." In my opinion, a better way to avoid heat artifacts would have been pulsing the laser. They did perform negative controls in non-expressing animals. This paper from the HHMI Scanziani lab looked at how inhibitory neuron activity shapes pyramidal neuron tuning properties. They expressed ChR2 in parvalbumin cells, and recorded in vivo using loose-patch. They then stimulated the cells using one second light pulses (blue bar), in combination with visual stimulation (grey area). Like Tan above, this is a minor sin, since they recorded from the cells they photostimulated, and know what activity they are inducing. In the supplement, they also provide negative controls. (Left) Image of a tdTomato-ChR2 expressing parvalbumin cell, recorded via loose-patch. (Right) Raster plot and PSTH from the cell in response to visual stimulation (grey area). The activity was higher for a combination of light (blue bar) and visual stimulation. From Figure 2, Atallah et. al., 2012. From Young Investigator Kreitzer's lab, this paper looks at how the direct and indirect pathways in the striatum influenced learning. ** To ensure that they were stimulating the cell type they intended, they used a chronic in vivo optrode to record spikes in response to light stimulation. For a veneer of control, they used different light intensities, ranging from 0.1-3mW, but used constant 1 second light pulses. PSTH of a neuron in response to constant 1 second light pulse. From Supplemental Figure 1, Kravitz et. al., 2012. In their words, "Neurons were classified as ChR2 expressing if they exhibited, within 40 ms of the laser onset, a firing rate more than threefold greater than the s.d. of the 1 s preceding the laser pulse." 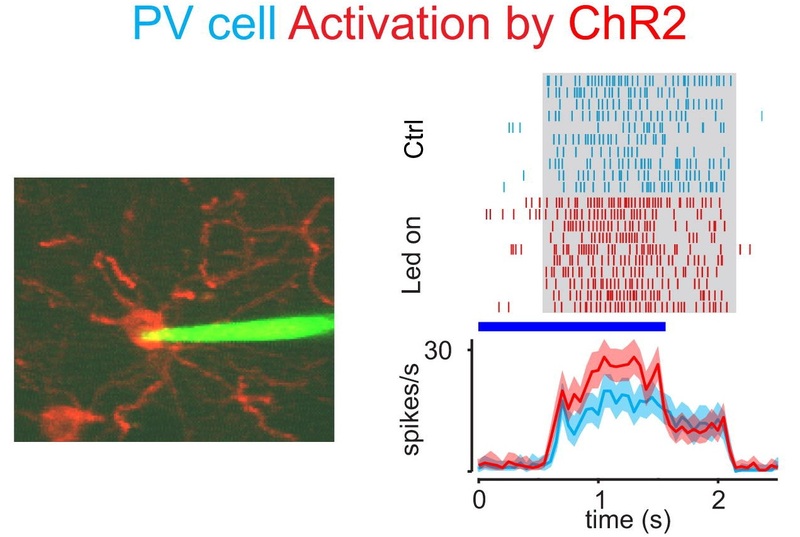 This strikes me as a crap criterion, since if there is any excitatory feedback in the network, it would be active within 40 ms. For example, the gradual increase in firing rate for this neuron looks odd. I asked the Luscher lab about connectivity in the striatum, and they said that the direct and indirect pathways inhibit each other, so it is unlikely in this case that Kravitz is recording the wrong neuron type. In any case, this is sloppy. ** Which Cre mice did they use? "Bacterial artificial chromosome (BAC) transgenic mouse lines that express Cre recombinase under control of the dopamine D1 receptor and A2A receptor regulatory elements were obtained from GENSAT." Is it too much to ask them to name which of the nine D1A or three A2a lines they used? There can be variability between lines which nominally target the same populations. Maybe I'm just being a pedantic curmudgeon. Maybe it's my background in cellular neuroscience where you always have to perform negative controls. But I think we should have higher standards for channelrhodopsin experiments. If these papers in high tier journals from respected labs (including Deisseroth on one paper!) can get away with sloppy channelrhodopsin work, what's getting through in other journals? If people simply followed the Two Pillars of Channelrhodopsin Photostimulation, their results would be cleaner and more reproducible, and get less guff from reviewers like me. I work with old school techniques in primates, so I don't know much about this, but at the risk of asking a dumb question: is it feasible to perform a heat control in the same animal by stimulating at some wavelength that won't that the rhodopsin is not sensitive to? I imagine that would be less annoying than recording in another animal. That sounds reasonable to me. For some tasks where stimulation can't be undone, like a conditioning paradigm, it wouldn't work. But for simple recording where you are looking at connectivity, like for Atallah or Poulet above, it would be great to have same-animal controls. I'm not aware of anyone who has done it, though.